The Art and Science of Love Workshop is based on the work of John Gottman, Ph.D. Dr. Gottman has learned what really makes relationships work by studying and following over 3,000 couples in over 40 years of research. 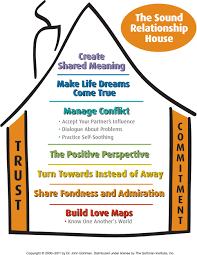 This workshop was designed by Dr. Gottman and his wife, clinical psychologist, Dr. Julie Schwartz Gottman, to teach what successful couples do to foster romance and harmony in their relationships. During the first day, couples learn how to build fondness, admiration, and closeness. On the second day, couples work on conflict management while learning new and important communication skills. Couples work privately on exercises designed to address the challenges common to all couples relationships. We are available as Certified Gottman Method therapists to support couples in one-on-one with exercises. There is no group work or public disclosure involved in the workshop. The workshop is considered to be psycho-educational, meaning that it provides instruction through lecture, demonstration, and practice of skills through private couples exercises. However, the workshop does not offer psychotherapy- meaning that although we are trained couples therapists, we do not take a detailed history or assess the functioning of the couples in the workshop and do not provide treatment based upon such an assessment. Instead we teach from a research tested curriculum and offer individual support to couples to complete exercises if they need it. "My wife and I experienced one of the best weekends we have shared together in years. Her words were 'life changing' as a way of describing the workshop. For me it was an answered prayer"
"I don't say this lightly - this workshop was game changing for my partner and I. The research-based Gottman method has been a catalyst to changing the dynamic of our marriage. The workshop gave us so many great tools that helped us break through old, destructive patterns in our relationship and create new, life giving ones." This workshop is designed to strengthen your marriage or relationship. If you have a strong relationship, this workshop will provide you with the insights and tools to make it a great one. If your relationship is distressed, then this two-day workshop will provide a road map for repair. The workshop is scheduled 8:30 am-5:00 pm Saturday and Sunday with an hour and 10 minute lunch and morning and afternoon breaks each day - Saturday registration starts at 8:00 am. Check out surrounding hotels in the area here.